Kids say the funniest things. It’s a fact. Everyone knows it, everyone thinks it and no one does anything about it. Until now. 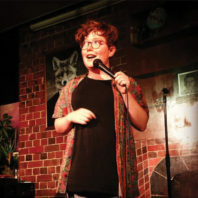 Daisy Berry is getting kids from ages 8–12 in a room and letting them roll with their funny side. All that silly and playful energy creates the most hilarious and out-there ideas, so why not write it down? Whether it’s a funny story, a knock-knock joke or even a silly song, just go for it! Get it out of your brain and onto paper. You can even share it and perform it if you’re feeling adventurous.